E-ATX complaint form factor of MB, 12" x 13" (30.5cm x 33.2cm). Dual Sockets of AMD G34, 1944-pin. - Support Eight SAS ports and RAID 0, 1, & 10. Buttons: Power On/Off, System Reset, UID. LEDs: Power, Hard drive, Networking, Overheat LEDs. 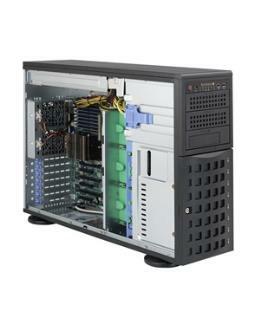 Eight 3.5" drive bays with HDD hot-swap tray, Enterprise SAS/SATA HDD recommended. Three 5.25" peripheral drive bays, one of them for 3.5" drive. AC input 100 ~ 240V, 50 ~ 60Hz, 11 ~ 4.5 Amp.